The Nomad is a survival tool. For the low to mid level price point, what you get is pretty good. Not really a bow you want to be using often if you’re a keen archer but for the intended purpose you can’t go far wrong with the Nomad. There are more well appointed and more expensive alternatives out there. But if the price point is good for you, get one to keep one in your cache, you won’t regret it. Did you like our review? 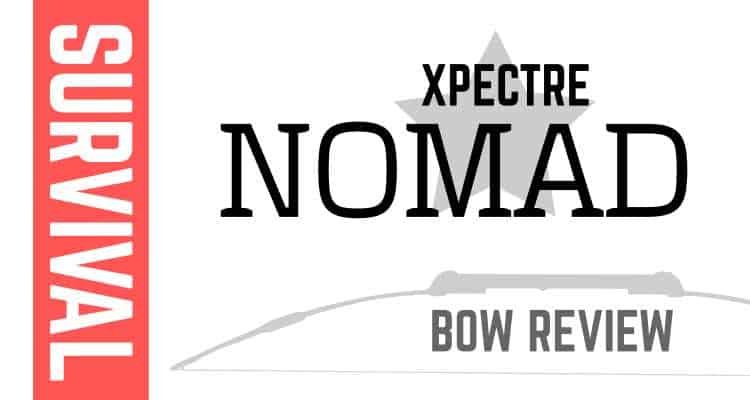 Xpectre are specialists in survival gear, and alongside the Nomad survival bow they produce several others such as the Spectre and Rapture. The entire range is well priced and functional. You might be a prepper or you may just be a general survivalist, either way you’re probably interested in exactly what you get for your money. A survival bow is designed to fold down small be durable and be something you can take anywhere with ease. I’m guessing that’s where the name Nomad comes from. A bow you can travel easily with and take anywhere. This is a small compact 17″ riser and when assembled and ready to shoot it is effectively just a square metal tube. There is nothing added to the riser for grip or comfort ergonomics. This isn’t something designed to be used for long periods of target archery! The arrow rest on this bow is just a plastic coated metal wire guide that is screwed onto the side of the riser. You can’t move the rest to the other side of the riser so in order to change the handedness of the bow you simply turn the whole bow upside down. One of the things you absolutely want a survival bow to be is portable. This one breaks down into 5 pieces of which the longest is 17″. That’s small enough to fit many places easily and is one of the smallest footprints for a survival bow we’ve seen to date. As already mentioned the broken down Nomad bow riser is only 17″ in length. It’s pretty compact. Because of that is in order to assemble it you need to fit several pieces together. Each of the limbs comes in 2 pieces each, combined with the riser that makes a total of 5. The notched ends of the longer limb section slide into the riser and locate onto a securing pin. Once these pieces are in place you attach the ends of the limbs to the longer limb sections in a similar fashion. All these pieces are slide/push fit. The final step of assembly is to string the bow. The assembled pieces are designed to stay in place by virtue of the tension of the bowstring so if you aren’t careful they can slip apart before the bow is strung. You’re probably best stringing this bow with step through method so gravity keeps the assembled pieces together until you’ve finished stringing. Once strung the bow is complete and secure and the pieces won’t fall apart. The entire process is tool free and could be accomplished in less than a minute if you wanted to get good at it. A 48″ Dacron string is supplied, this doesn’t come with a nock point and it’s probably a good idea that you add one in your preferred way. Adding either brass rings or material. A basic black nylon carry case with a shoulder strap that is big enough to carry the broken down bow, arrows and string. Normally the package supplied with the Nomad includes 3 take-down arrows. These are 2 part arrows that simply screw together. They come with field points and plastic vanes and are 31″ long. The picture above shows the Nomad in pieces. These limbs are 2 piece fiberglass and resin composite. We go over how they fit together in the assembly section. Replacement limbs are available direct from the manufacturer should you lose one of the 4 pieces that make them up, or break one. This is a short bow. At 48″ you’re not getting the length of limb that a normal traditional or recurve bow shooter would be looking for to give them the most forgiving shots. As a survival tool however the Nomad shoots well and is relatively powerful. With some decent broadhead arrows I’m sure this would be good enough to mid sized game from 40 yards or even further depending on your skills. Not a thing of beauty, this bow is a thing of function. The limbs aren’t the same color as the riser so there’s a 2 tone finish on this bow. We aren’t going to score this well for styling. It’s something to keep in a cache or bag somewhere for a critical situation. Something to keep hidden until needed. Usually more than twice the price and not supplied with any arrows. But… you get what you pay for. The SAS Tactical is available in more powerful draw weights, is a longer assembled bow at 60″ AMO giving a better shot. It has storage inside the riser for takedown arrows. Comes with a more useful camo carry bag. It’s lighter overall due to the materials used in construction being of a higher grade. Comes coated with a non-reflective paint too. Altogether the SAS is a better bow, but at the risk of repeating myself, it’s much more expensive and bigger when broken down (21″). Checkout the full review here. The Spectre comes in a choice of 3 draw weights, 35, 45 and 55 lbs rather than the fixed 45 lbs for the Nomad. The Spectre II is the slightly more affordable version of this bow however but there is a trade-off for that affordability. The Spectre has one piece limbs as opposed to the 2 pieces that the Nomad limbs break down into. This contributes to the Spectre being 23″ when broken down which is 6″ longer than the Nomad. The Nomad comes with takedown arrows as standard whereas to keep those costs down the Spectre doesn’t and you get 3x standard one piece arrows.. More in our full review. Xpectre produce bows in the USA. They dedicate themselves to providing dependable survival products. All of their product range is geared towards survival with the odd camping accessory thrown in. You can visit their website here.